16 June 2011: This week Jo-Ann is wearing a vibrant dress by Kluk CGDT. This week Jo-Ann is wearing a stunning, vibrant dress by Kluk CGDT. 19 May 2011: This week Top Billing presenter Jo-Ann is wearing a glamorous dress by Klûk CGDT. 3 February 2011: This week Jo-Ann Strauss looks stunning in her dress by Gideon. 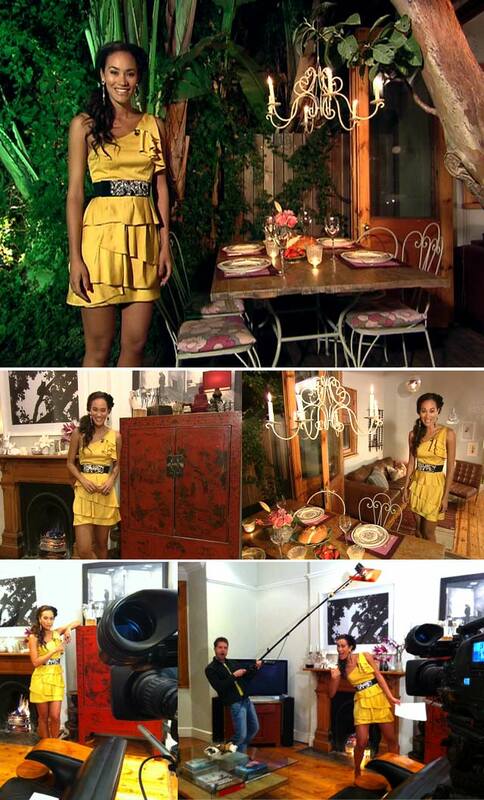 This colourful african-chic gown from Hip Hop, was right at home in this weeks 'earthy' location. The vibrancy of the organic pattern is complemented by the simple lines of the gown. "The vibrant colour of this Cindy Bam creation really popped against the neutral decor; and the graceful yet flirty design was a perfect match for jo anne's bubbly personality! ''This fun colourful dress from Malick was perfect for the playfully quirky elements of the house"
Cindy Bam designed this dress especially for Jo Anne, so it fits her body perfectly and she absolutely radiates in sunshine yellow. The downwards ruffle detail really extenuates the grace of her tall frame, and the beautiful details such as the lace and hand beading, really made this an ''extra-amazing'' dress for our show. 25 February 2010: On this weeks show Jo-Ann Strauss beautiful dress was created by Kluk CGDT. 3 December 2009: In this weeks episode, a yellow dress created by award winning Cape Town fashion designer Gabi Rosenwerth adorns our gorgeous presenter, Jo-Ann Strauss.